Cut and prepare the Shark Filets into medallions. Season the Shark Filets with the Kosher Salt first. Sprinkle the Shark Filets with the coarse ground Black Pepper to evenly coat the medallions and lightly dust the fish with flour. Place a saute pan over medium heat and add the oil. Place the medallions into the pan and allow to cook for 2-3 minutes until golden brown edges appear. Turn the medallions over and sear for an additional 2-3 minutes until the meat becomes firm with a slight spring back when touched. While the Shark Filets are cooking, prepare the other ingredients to complete your dish. Remove the Shark from the pan and allow to rest while completing the accompaniments. Pool the Red Wine Sauce on a plate or into a bowl. Arrange the Peppered Shark Medallions overlapping on top of the sauce. Place the Roasted Mushrooms and Shallots around the medallions and arrange the Steamed Asparagus tips around the dish. Finish the plate with some Herb Oil and serve. In a medium sized bowl, combine the olive oil, salt, black pepper, garlic, paprika, soy sauce, the finely chopped onion, finely chopped pepper, orange juice and lime juice, mixing together evenly. Make enough marinade so that the shark steaks or fillets will be completely covered, when put in the bowl and the salad seasoned. Put this in the refrigerator for 30 minutes, so that the Mako will absorb the marinade sauce. After marinating, place the shark steaks or fillets on a hot grill, for 5 minutes then flip over for another 5 minutes. Turn the meat over onto the side first grilled and allow another three minutes of grilling time per side, until the fish starts flaking easily. On a separate section of the grill, put the potatoes whole, allow them to cook for 3 to 4 minutes, then turn over and repeat. The mushrooms and onion rings should be placed next to the potatoes and cooked for 3 minutes then removed from the grill. While the potatoes and shark meat are being cooked, in a large bowl, toss the lettuce leaves, tomatoes, olive and pepper slices with the unused marinating sauce. After all preparations and cooking are done, in a large plate, dish out the grilled Mako shark and salad. Cut the potatoes in half, adding butter to the inside part and set next to the salad. Enjoy. Fresh Mako Shark meat ranges from pink, to pinkish-white in color, when uncooked it has a firm, meaty texture, which when cooked becomes a little whiter in color, with a moist and flaky feel. With succulent, sweet seafood taste similar to swordfish, but moister in the mouth, fresh Mako shark is an absolute delight and always welcome at the table. One of the fastest and most predatory fish, Mako sharks called Bonito or Pointer sharks are caught along the Gulf of Mexico, Tahiti and the South American coastlines. Commercial fishermen and sport anglers both employ the hook and linen trolling technique to catch this prized beast. With high levels of Selenium, Protein, Iodine, Magnesium, Potassium, Iron, Niacin, Phosphorus, vitamin B6 and B12, fresh Mako shark steaks are an ideal source of essential nutrients, needed to keep the body functioning properly. Very easy to prepare fresh Mako shark steaks can be used in chowders, grilled with potatoes or baked and enjoyed with rice. Their delicious sweetness and appetizing aroma bring warmth to any table. 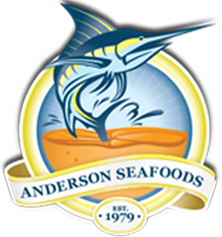 When buying Mako Shark online, make Anderson Seafoods your first and last source.